Long Beach Heating & Air Conditioning is your best source for thermostats in Long Beach. We've sold, installed, and repaired thousands of thermostats over the last 60 years throughout Long Beach, Signal Hill, Huntington Beach, Manhattan Beach, San Pedro, Palos Verdes, Los Alamitos, Hermosa Beach, Redondo Beach, Torrance, Downey, Paramount, and surrounding areas. We're family owned and operated, fully licensed and insured, and Bryant Factory Authorized. To ensure you get reliable, expert service, all of our thermostat installations and repairs are performed by highly experienced, NATE-certified HVAC technicians. Our prices are fair and competitive, and we stand by our work with excellent parts and labor warranties. 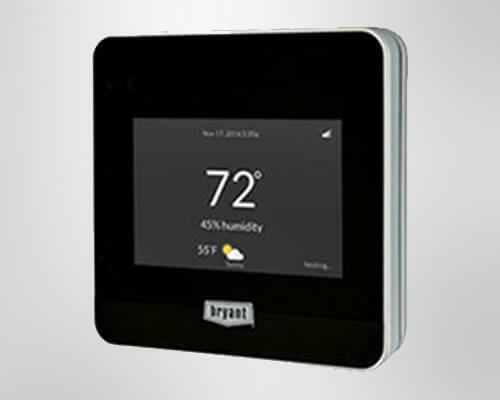 At Long Beach Heating & Air Conditioning, our range of thermostats includes something for everyone. We have non-programmable thermostats with easy-to-read displays for those looking for a simple and affordable option; Wi-Fi programmable thermostats that can be programmed from a cell phone; as well as intuitive thermostats that can learn your habits and automatically adjust your heating and cooling scheduled for greater energy efficiency and continuous comfort. Choosing the right thermostat for your needs is crucial since it is responsible for both controlling your energy costs and maximizing your indoor comfort. To help you select the best thermostat for your needs and comfort, we offer free on-site consultations throughout Long Beach, Huntington Beach, Manhattan Beach, Palos Verdes, Los Alamitos, Torrance, Redondo Beach, Seal Beach, Lakewood, Downey, Carson, and all surrounding areas. During a consultation, we'll evaluate the heating and cooling needs of every room in your home or business, whether you have an existing HVAC system or are looking to install a new one. We can also design solutions for special circumstances. We've helped clients upgrade to wireless or remote controlled thermostats, relocate thermostats for aesthetics and to read indoor temperatures better, and added additional zones and thermostats for larger homes. With every installation, our technician will gladly provide education on how to operate and program your new thermostat. Sometimes when a heater or air conditioner isn't working, it is actually the result of a malfunctioning thermostat. At Long Beach Heating & Air Conditioning, you can trust our experienced and highly trained HVAC technicians to properly diagnose and repair any issue you are having with your HVAC equipment. We regularly work on all major makes and models of thermostats, heaters, air conditioners, heat pumps, and mini-split systems. We charge $89 for on-site diagnostic visits and provide upfront, flat-rate pricing for repairs. We seek to provide real value with every diagnostic visit and repair, and warranty our repairs for 30 days. If it appears that your thermostat is beyond repair, we can discuss your options for replacement. Call today to learn more about our thermostat repair services in Long Beach, Huntington Beach, Seal Beach, Lakewood, Downey, Carson, and the South Bay. Customers for 12 years. Always nice, good, on time and stress free. We've been customer of Long Beach Heating & Air Conditioning, Inc. for 12 years now and they have always been prompt to respond. They get here on time and they do what they need to do, so, it's been pretty stress free for us. They are just really nice people and I'm happy to give them good feedback.